Miami Dolphins quarterback Ryan Tannehill (17) celebrates after running back Lamar Miller (not pictured) scors a touchdown against the Houston Texans during the first half. MIAMI GARDENS, Fla. (AP) — The Miami Dolphins led 35-0 midway through the first half, and while the rest of the sideline celebrated, interim coach Dan Campbell stood alone, staring at the scoreboard and managing to keep a straight face. For Campbell, it was business as usual, with blowouts the norm so far. The Dolphins’ astounding turnaround under their new coach gained momentum Sunday, when Ryan Tannehill completed his first 18 attempts and threw for four scores in first 16 minutes to help beat the Houston Texans 44-26. The drubbing was even more emphatic than Miami’s 38-10 win at Tennessee a week earlier in Campbell’s debut as a head coach. Fans chanted his name as the game ended. 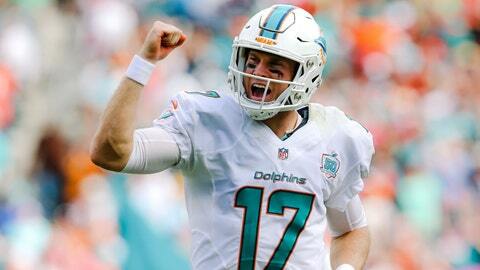 Ryan Tannehill set the NFL record for most consecutive completions with his start Sunday. "It’s not me; it’s this team," Campbell said. "These guys want it. To watch the transformation they’ve made and the ownership they’ve begun to take, I’m glad I’m part of it." Campbell is only the fifth interim coach of 26 in the NFL since 2000 to win his first two games, according to STATS. Since the firing of Joe Philbin on Oct. 5, the Dolphins (3-3) have gone from notorious underachievers to contending for their first playoff berth since 2008. "I always said this team had the players and playmakers and talent to play like we have the last two weeks," Tannehill said. "For whatever reason we weren’t showing up the way we wanted to. Give credit to Dan and rest of the coaching staff that they’ve turned it around." The Texans (2-5) are heading the other direction. To compound their misery, running back Arian Foster hobbled off the field late in the game with an Achilles tendon injury that might end his season. The Dolphins had been 0-7 previously against Houston, the only team they had never beaten. Miami faces a quick turnaround before playing Thursday at AFC East leader New England (6-0). Miami became the first team in at least 75 years to score four offensive touchdowns of at least 50 yards in a half, according to STATS. Tannehill extended his two-game streak to 25 consecutive completions, an NFL record, before he threw his only incompletion in the fourth quarter. Jarvis Landry scored on a jaw-dropping 50-yard catch and run through most of the Texans’ defense. "Somehow he makes 46 guys miss," Tannehill said. Landry also caught a 10-yard touchdown pass from Tannehill. Lamar Miller scored on a 54-yard reception and an 85-yard run. Rishard Matthews scored the game’s first points when turned a short pass from Tannehill into a 53-yard score. That was all in the opening half, when the Dolphins built a 41-0 lead. They tied a franchise record of 21 points in the first quarter, done three other times, and broke the team mark of 35 points at halftime set in 1967, its second season. The Dolphins began pulling their regulars at halftime. The Texans drew little solace from scoring four touchdowns in the second half. "Terrible," coach Bill O’Brien said of the Texans’ performance. "It’s something I take full responsibility for." There were signals before the game that the Texans were not ready. Former starting quarterback Ryan Mallett missed the team flight and made the trip on his own. "You’ve got to be on time," Mallett said. "That’s not the leadership role I need to exhibit. I need to be better." The Dolphins, by contrast, were nearly flawless until a missed extra point after their sixth touchdown. Miller rushed for 175 yards on 14 carries, all in the first half. 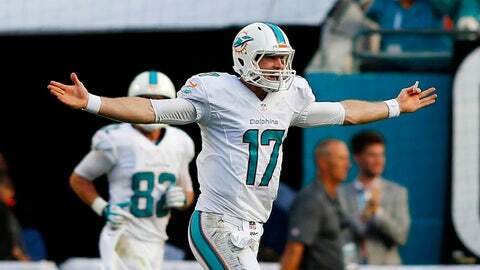 Tannehill went 18 for 19 for 282 yards, with a perfect passer rating of 158.3. Miami did not have a 50-yard play from scrimmage previously this season. Tannehill became the first quarterback to throw three touchdown passes of 50-plus yards in a first half since Randall Cunningham in 1998, according to STATS. Reshad Jones scored on a 23-yard interception return, snatching a deflected pass and somersaulting into the end zone for the second week in a row. He became the first Dolphins player with a pick-six in consecutive games. Brent Grimes shadowed Houston’s DeAndre Hopkins, who was held to six catches for 50 yards, ending his franchise record-tying streak of four consecutive 100-yard games. Miami’s Ndamukong Suh, one of the underachievers earlier in the season, had his first two sacks, three tackles for a loss, two passes defended and six tackles. "I want to be a part of the party," he said. NOTES: Dolphins CB Zack Bowman hurt his shoulder in the second quarter. LB Spencer Paysinger hurt his groin and did not return. … Texans LB Akeem Dent hurt his hamstring in the fourth quarter. … Miami has scored 82 under Campbell, the most in two games for an interim coach since 1961.